Art and Eve Kihn started Mat-Su Tool Repair LLC in November of 2007 at the request of Ron Higgins of South Central Equipment Wasilla. Art and Eve became entrepreneurs in 1980 in trucking as Owner/Operators owning several trucks and trailers. They retired in 2006 from trucking wanting to downsize from 600 foot pound torque wrenches for wrestling truck tires to smaller tools. When the opportunity to move into tool repair was made available, they jumped at the opportunity. Mat-Su Tool Repair started out with a contract with DeWalt for Warranty Repair and now encompasses more than 80 Vendors. Since opening, we have printed more than 32,000 invoices. Our customers include Federal, State, Boroughs, Cities, Contractors and home owners. 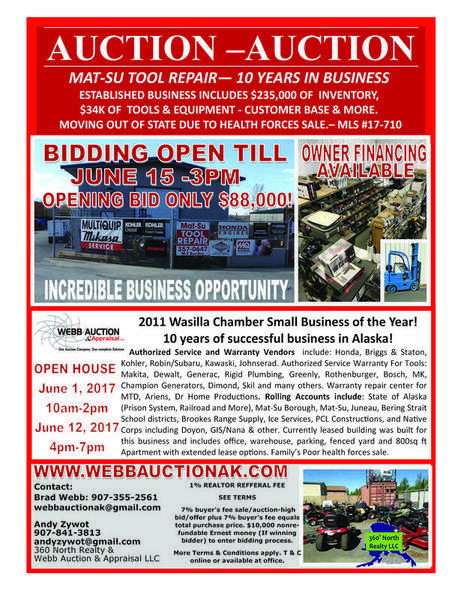 The next owners of Mat-Su Tool Repair will have no problem growing the business to great proportions. Art and Eve are willing to stay on location for 2 months to ensure a successful transmission. Due to age and health related issues, we wish to retire. We will not be involved with any business or enterprise in Alaska as our destination will be Alberta where our Grandchildren, 1 great Grandchild and our daughters live. BRIGGS & STRATON * HONDA * KOHLER * KAWASAKI * MAKITA * DEWALT * MTD* BOSCH * SKIL * MK * DIMOND * GENERAC * AND MANY MORE! Call 907-355-2561 or 907-232-0602 for more information or email us!